Whether you just planned a last minute together or dropped the ball preparing for that scheduled holiday party, help is available to get your home in order for your soon-to-arrive guests. No one likes to be a bad host, and a cluttered house is widely considered a big no-no in this regard! You can still tidy the place up without losing your head (and your nerve). Have you ever heard of the 80/20 rule, or Pareto principle? This theory states that 80% of the effects derive from 20% of the causes. It’s been applied successfully to the fields of business and economics, but encompasses virtually any task, and this includes rushed house cleaning chores! Instead of focusing all of your time and energy on minor and insignificant things (like putting away the kids’ toys or organizing your kitchen drawers), concentrate on the big-ticket items. It’s OK to go on what we like to call a pick up craze. Grab the biggest basket you can find and toss everything that’s on the floor inside while traveling from room to room. Never mind the clutter in your hands, there is plenty of time to organize it after your guests happily depart. Depending on when people are going to arrive, you can choose either to put items where they belong, or place the basket in a closet or storage room until you are ready to deal with them. The one room in your house that deserves the utmost attention under these circumstances is often overlooked while cleaning under time restraints: the bathroom. You can safely temporarily stash your clutter in your master bedroom or laundry space as it’s a safe bet guests won’t be visiting these areas. But they will likely be making trips to the restroom, the number of which obviously increases when more guests are present. 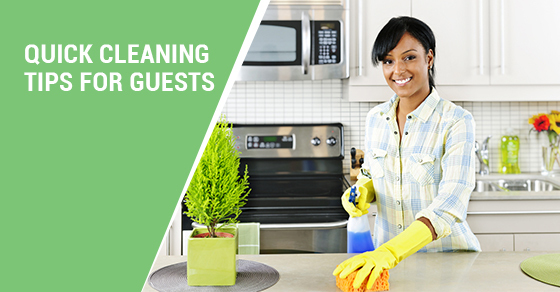 Sweep and mop the floor, wipe down all surfaces, and clean the toilet bowl. A good time saving tip is to apply cleaning solutions to the tub, sink and toilet and let them soak while tending to the flooring. This is the art of multi-tasking at its finest, and works wonder during a time crunch. While you’re in the restroom, ensure that it’s fully stocked with easily accessible toilet paper and scent-masking items like candles, air fresheners or matches. This will help ensure anyone visiting your bathroom will remain comfortable with whatever they have to do. Finish by cleaning the floors in the kitchen and family room, as these are typically where most guests reside during their stay. Appliances should be given a quick pass over with a dusting cloth as well. Remember, apply the 80/20 rule and you’ll have everything in order before your guests arrive!